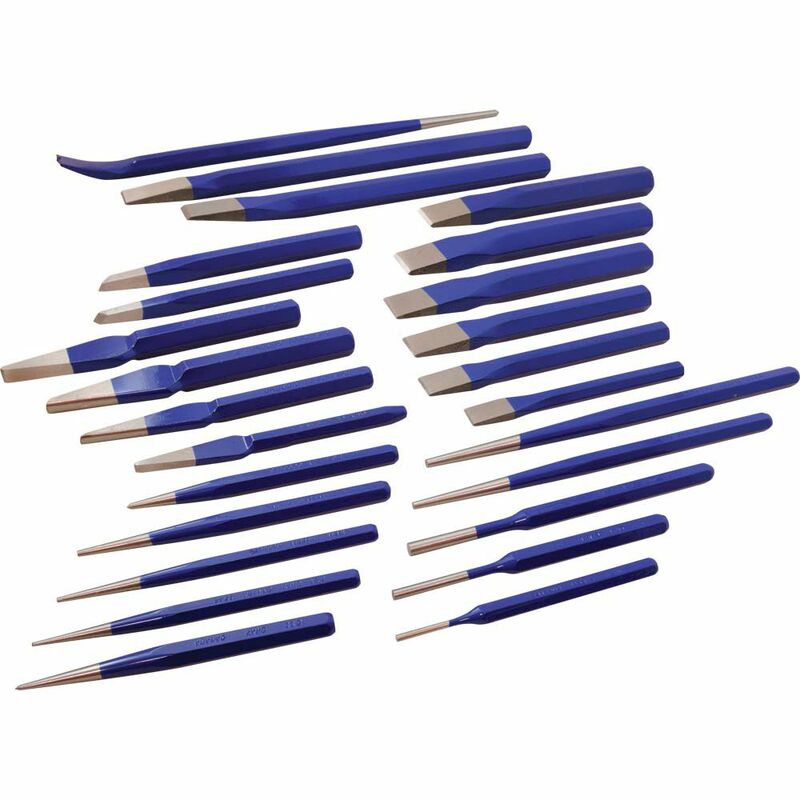 The punches and chisels in this 25 piece set are specially heat-treated to provide a hard working end and softer striking end to avoid chipping. All Gray punches and chisels are made from the highest quality materials for maximum tool life. Made in Canada and backed by Gray Tools worry-free lifetime warranty. Contains: Flat Chisels 1/2", 5/8", 3/4", 7/8", 1", 1 1/8", Cape Chisels 1/4", 3/8", Long Flat Chisel 3/4", Diamond Point Chisels 1/4", 3/8", Round Nose Chisels 1/4", 3/8", Long Taper Punches 5/32", 3/16", Prick Punches 3/8", Taper Punches 1/16", 3/32", 1/8", Pin Punches 1/8", 3/16", 1/4", Centre Punch 3/8", Rivet Buster Chisel 7/8", and Pinch Bar 5/8". 25-Piece Punch And Chisel Set The punches and chisels in this 25 piece set are specially heat-treated to provide a hard working end and softer striking end to avoid chipping. All Gray punches and chisels are made from the highest quality materials for maximum tool life. Made in Canada and backed by Gray Tools worry-free lifetime warranty. 25 Piece Punch And Chisel Set is rated 5.0 out of 5 by 1.